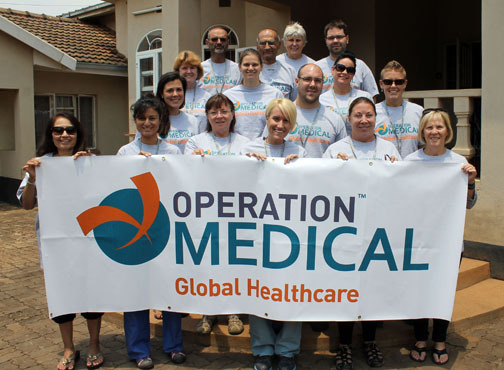 Operation Medical’s first surgical mission for its 2014/2015 year took place in Malawi, Africa. The team performed 59 surgical procedures in the operating rooms and 120 procedures in the emergency room at Kamuzu Central Hospital located in Lilongwe the capital of Malawi. Dr. Baker Henson, the mission leader said “The mission was very successful considering it was the first mission in Malawi for Operation Medical. In one week’s time the team made a significant impact on a local area in Malawi. The entire team worked exceptionally well together and remained flexible throughout the mission. Each individual was key to the success of the mission.” Dr. Henson is looking forward to future missions in Malawi. Malawi is a small country in southern Africa and is situated east of Zambia, west and north of Mozambique and south of Tanzania. Malawi has a population of approximately 16.5 million people. About 80% of the population lives in rural areas with 53% of the population below the poverty line. Life expectancy is 52 years. As of now there are less than 50 registered surgeons working in the country. Lilongwe, the capital of Malawi, has a population of approximately 800,000 people and is located on the main road between Zambia and Lake Malawi. The population of Lilongwi is rapidly growing due to extreme poverty and starvation that brings people from rural villages into the city. Kazumu Central Hospital is a government run hospital and is the tertiary referral center for the central region of Malawi serving about 6 million persons. Estimates of the hospital’s size range from 600 to 1,000 beds; however, actual occupancy is probably closer to 1,200 to 1,500 occupancy. The hospital has 4 operating theatres and one ICU with 4 beds. The majority of their patients are those who cannot afford private facilities. Currently there are 3 general surgeons on staff at Kazumu Central Hospital. The 5 day camp was held at Kazumu Hospital from October 6 to October 10, 2014. Prior to the start of the 5 day camp Dr. Bipin Patel presented a lecture to 3rd year medical students attending the Medical College of Lilongwe. The lecture, “Gastro-Intestional Malignancies”, was presented to 18 students and focused predominately on colon cancer. Not enough could be said about the team’s compassion, dedication and commitment to the patients at Kazumu Central Hospital. Over 15 months ago Operation Medical Advisory Board member Dr. Baker Henson began planning this mission and coordinating with Kazumu Central Hospital staff including Dr. Carlos Vanela, Chief of Surgery, Dr. Enock Ludzu, Chief Resident and Richard Bwanali, Head Operating Room Nurse. Operation Medical also owes a huge thank you to World Camp for providing us a safe and comfortable living environment close to Kazumu Central Hospital.